The demand for Emoji Flags for England, Scotland, and Wales has been acknowledged by Unicode President Mark Davis. There is great demand for the flags for subregions (aka “subdivisions”) within countries, such as in document 16-180. 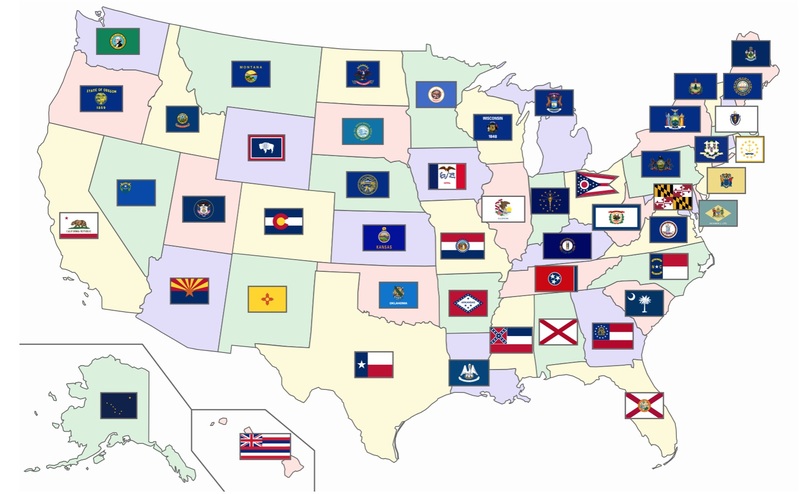 While we want to provide for these, we don’t want to encode additional flags one at a time. Davis goes on to describe a specific way to implement these flags which would allow vendors to implement emoji flags for any subregion. England, Scotland and Wales are highlighted as prominent examples that vendors may wish to include. These are also the only three flags included in the WhatsApp emoji picker, that aren't standardized as part of Unicode. Above: WhatsApp has worked around Unicode to include these three emoji flags. Named TERIS, this method of creating subregion flags is (relatively) simple to implement, and means Unicode would hand decisions on which flags to include over to individual vendors such as Apple or Google. Should TERIS go ahead, any subregion defined by ISO 3166-2, would be eligible for an emoji flag. Non-subregion flags such as the rainbow or pirate flags (or historic flags) would not be eligible to use this method, and could be proposed as individual characters or Emoji ZWJ Sequences. Above: Rainbow Flag is implemented as an Emoji ZWJ Sequence. Given this latest progress on subregion flag support, we could see flags for England, Scotland and Wales hit phones as soon as 2017. "If they are going to do the Home Nation flags, I think they absolutely have to do all 50 state flags"
"How often have you ever wanted to use a state flag for Australia? Never. How often does someone from Texas want to use a Texas flag emoji? I bet every day of their life"
Whether Texans truly do want an emoji flag every day of their life is difficult to quantify, but popularity is just one factor used in determining new emoji characters. The whole discussion is worth a listen to get a feel for how any changes and additions to flags in a global standard is a complex task. Individual vendors are likely to use similar criteria to existing emoji proposals to determine which subregion flags should be included. These include data such as likely usage and contexts in which lack of availability causes issues in running text. In the example of England, Scotland, and Wales, a primary issue is that these countries frequently compete at international events individually. This is a trait not common among other subregions such as US States. Current emoji flags are already vendor-specific, with Unicode providing a mechanism for any ISO-3166 country code to be used as a flag. This sees varied support by platform where for instance 🇲🇶 Flag for Martinique is supported by Apple and LG, while 🇻🇦 Flag for Vatican City also enjoys the support of Google. Above: Flag for Martinique is supported by fewer platforms than Flag for Vatican City. Microsoft opts out of this game altogether, including a total of zero emoji flags, and instead displays the two-letter regional indicators for all countries. Not interested in Unicode minutiae? Here's a good place to tune out! A valid sequence using TERIS is referred to as an "emoji extended flag sequence". Only the first letter is a capital, and uses the existing 26 Regional Indicator letters which already exist to make current emoji flags. The remaining letters are lowercase and use relatively unknown Unicode characters called Tag Latin Small Letter A through to Tag Latin Small Letter Z. Each emoji extended flag sequence ends with an invisible character called cancel tag. Unlike Regional-Indicator pairs, these sequences can be any length, should that be an issue in future. Systems with support for these new emoji extended flag sequences would read each sequence and display the relevant flag emoji instead. A system updated to support TERIS which doesn't include a specific subregion flag would (should) show some kind "missing flag" glyph. If a system has no idea what TERIS is, the first Regional Indicator letter would show as the fallback for backward compatibility. 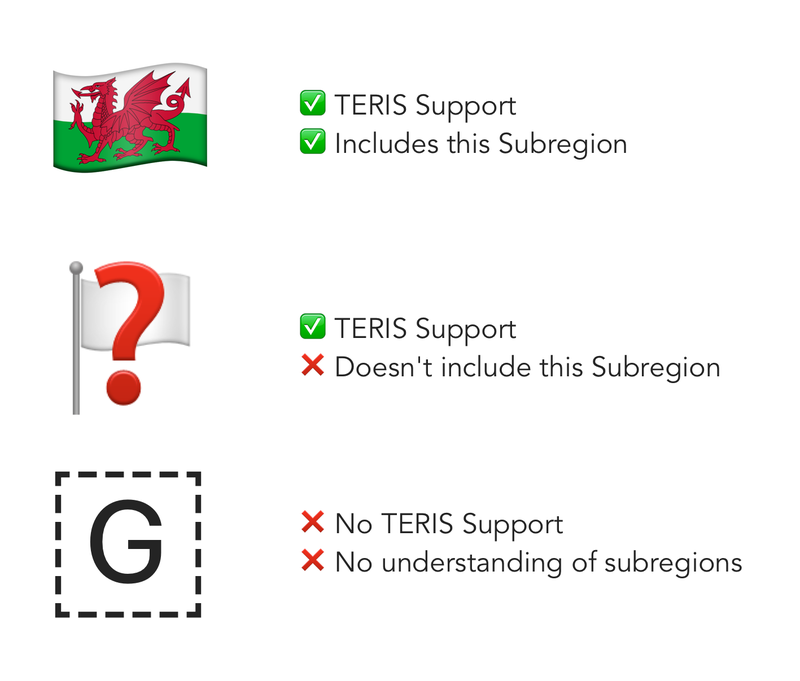 Andrew West has a great test page which outlines the three proposed methods of implementing subregion flags, including TERIS. Work continues on TERIS and subregion flag support, with the current focus at Unicode remaining on wider gender representation. It's likely we could see support for subregion flags introduced in 2017, possibly alongside Unicode 10 in June.